Four years ago a teenager in our church wrote to me for advice about life in general, and identity in particular. Here is what I wrote, with a big dose of autobiography for illustration. My experience of coming out of an introverted, insecure, guilty, lustful, self-absorbed adolescent life was more like the emergence of a frog from a tadpole than a butterfly from a larva. Larvae disappear into their cocoons and privately experience some inexplicable transformation with no one watching (it is probably quite messy in there) and then the cocoon comes off and everyone says oooo, ahhh, beautiful. It did not happen like that for me. Frogs are born teeny-weeny, fish-like, slimy, back-water-dwellers. They are not on display at Sea World. They might be in some ritzy hotel's swimming pool if the place has been abandoned for 20 years and there's only a foot of green water in the deep end. But little by little, because they are holy frogs by predestination and by spiritual DNA (new birth), they swim around in the green water and start to look more and more like frogs. First, little feet come out on their side. Weird. At this stage nobody asks them to give a testimony at an Athletes in Action banquet. Then a couple more legs. Then a humped back. The fish in the pond have already pulled back: "Hmmm," they say, "this does not look like one of us any more." A half-developed frog fits nowhere. But God is good. He has his plan and it is not to make this metamorphosis easy. Just certain. There are a thousand lessons to be learned in the process. Nothing is wasted. Life is not on hold waiting for the great coming-out. That's what larvae do in the cocoon. 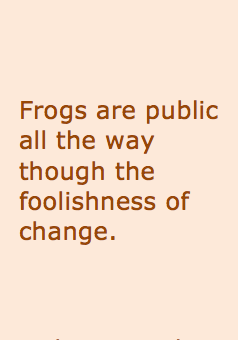 But frogs are public all the way though the foolishness of change. I think the key for me was finding help in the Apostle Paul and C. S. Lewis and my father, all of whom seemed incredibly healthy, precisely because they were so absolutely amazed at everything but themselves. They showed me that the highest mental health is not liking myself but being joyfully interested in everything but myself. They were the type of people who were so amazed that people had noses—not strange noses, just noses—that walking down any busy street was like a trip to the zoo. O yes, they themselves had noses, but they couldn’t see their own. And why would they want to? Look at all these noses they are free to look at! Amazing. The capacity of these men for amazement was huge. 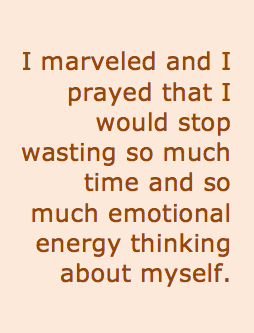 I marveled and I prayed that I would stop wasting so much time and so much emotional energy thinking about myself. Yuk, I thought. What am I doing? Why should I care what people think about me. I am loved by God Almighty and he is making a bona fide high-hopping frog out of me. And we all, with unveiled face, beholding the glory of the Lord, are being transformed into the same image from one degree of glory to another. 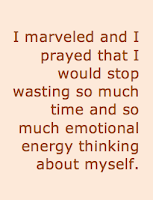 This was one of the greatest secrets I ever discovered: Beholding is becoming. Introspection must give way to amazement at glory. When it does, becoming happens. If there is any key to maturity it is that. Behold your God in Jesus Christ. Then you will make progress from tadpole to frog. That was a great discovery. Granted, (so I thought) I will never be able to speak in front of a group, since I am so nervous. And I may never be married, because I have too many pimples. Wheaton girls scare the bejeebies out of me. But God has me in his hand (Philippians 3:12) and he has a plan and it is good and there is a world, seen and unseen, out there to be known and to be amazed at—why would I ruin my life by thinking about myself so much? Thank God for Paul and Lewis and my dad! It’s all so obvious now. Self is simply too small to satisfy the exploding longings of my heart. I wanted to taste and see something great and wonderful and beautiful and eternal. It started with seeing nature and ended with seeing God. It started in literature, and ended in Romans and Psalms. It started with walks through the grass and woods and lagoons, and ended in walks through the high plains of theology. Not that nature and literature and grass and woods and lagoons disappeared, but they became more obviously copies and pointers. The heavens are telling the glory of God. When you move from heavens to the glory of God, the heavens don’t cease to be glorious. But they are un-deified, when you discover what they are saying. They are pointing. “You make the going out of the morning and the evening to shout for joy” (Psalm 65:8). What are the sunrise and sunset shouting about so happily? Their Maker! They are beckoning us to join them. But if I am grunting about the zit on my nose, I won’t even look out the window. 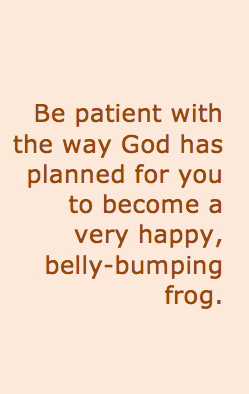 So my advice is: be patient with the way God has planned for you to become a very happy, belly-bumping frog. Don’t settle for being a tadpole or a weird half-frog. But don’t be surprised at the weirdness and slowness of the process either. How did I become a preacher? How did I get married? God only knows. Incredible. So too will your emergence into what you will be at 34 be incredible. Just stay the course and look. Look, look. There is so much to see. The Bible is inexhaustible. Mainly look there. The other book of God, the unauthoritative one—nature—is also inexhaustible. Look. Look. Look. Beholding the glory of the Lord we are being changed. I love you and believe God has great froggy things for you. Don’t worry about being only a high-hopping Christlike frog. Your joy comes from what you see. There is another metamorphosis awaiting. It just gets better and better. God is infinite. So there will always be more of his glory for a finite mind to see. There will be no boredom in eternity.